Sep. 1957 Kunio Kawasaki starts sales of raw oysters in Akitsu-cho, Toyota-gun in Hiroshima. Jun. 1963 Establishes a sales office in Ondo-cho, Aki-gun in Hiroshima. Jul. 1970 Establishes Kunihiro Fisheries Co., Ltd. in Onomichi with 5,000,000 yen in capital. Jan. 1974 Establishes a refrigeration factory at the Main Office location. Apr. 1974 Starts operation of the Main Office. Becomes a cooperative company of Nippon Suisan Kaisha, Ltd.
May 1979 Builds a freezer. Jun. 1979 Warehouse business permit. Apr. 1980 Builds a wastewater treatment plant. Oct. 1980 Establishes the Tokyo Sales Office. Nov. 1989 Newly establishes the Fukuyama Factory. Jun. 1991 Introduces the Corporate Identity (CI). Jul. 1991 Establishes the Osaka Sales Office. Apr. 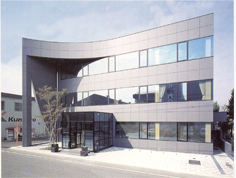 1992 Changes the company name to Kunihiro Inc.
Sep. 1993 Completes the Main Office building. Aug. 1997 Completes the sterilization inspection building (norovirus analysis laboratory). Dec. 1999 Expands the Fukuyama Factory. Aug. 2005 Completes the Onomichi Factory. Oct. 2006 Onomichi Factory granted ISO 9001:2000 certification. Feb. 2007 Frozen steamed oysters granted HACCP certification. Sep. 2007 Fukuyama Factory granted ISO 9001:2000 certification. Oct. 2010 Granted ISO 14001 certification. Kunihiro Inc. is aware that personal information obtained from our customers is an important asset and works to protect such information according to the following principles in its storage and use so that our customers can feel secure in Kunihiro’s Hiroshima oysters. The Company specifies the purpose of collection and the scope of use of personal information and obtains approval from the customer when collecting personal information. The Company does not use personal information for any purpose other than the intended use with approval obtained from the customer. The Company will not disclose personal information to any third parties except when approval is obtained from the customer or when a request involving a legal obligation is received from the judicial or administrative branches of government. The company ensures safety by storing personal information under a rational management system to prevent unauthorized access, falsification, destruction, loss, and leakage, etc. The Company will immediately respond to the request from the customer on the disclosure of his/her own personal information or on the correction or deletion of incorrect information. *The Company implements the above principles on the protection of customer’s personal information, complies with the laws, regulations, and standards on the handling of personal information, and continuously reviews these principles to improve them.